This is what I ordered. This is what I always order. When I discover something really good, I have to feel especially adventurous to stray from it — boring, but dependable. So, when my lunch buddy ordered the Gyros Wrap (almost identical to my plate) a mighty-menu-meal struggle waged in my mind. Do I order something different for the sake of the blog? Or, do I stay dedicated to my Gyros Plate fav? You see the answer pictured above. One bite told me I’d made the right choice. The generous pile of lean ground beef and lamb had lots of flavor. I always appreciate the authentic Grecian Sauce which I use to make my own Gyros wrap. The hummus and fresh Greek salad are lite, tasty compliments to the otherwise hearty meal. It’s well worth the price — especially with the unlimited servings of hot naan (a HUGE fluffy sort of Mediterranean tortilla). This location is near the Medical Center, but they’ve just opened a new location on 1604 and Blanco. Click here for more info about Pasha. We recommend: Almost any menu item. Also, go during “off hours” because of the crowd. Ocho — Oh So Beautiful! Fellow blogger, Shannon Ahern, recently posted a wonderful article about the new Ocho Lounge at the Hotel Havana. Based on her story, we just had to pay a visit. The scene is absolutely delightful. The architecture is its own form of entertainment and the views to the River Walk below are fantastic. With cooler weather, it will be a wonderful walk along the newer stretch of the San Antonio River Walk from The Pearl to Ocho for a scrumptious brunch. The SWEET PLANTAIN GRIDDLE CAKES ($14) with Mexican Crema, Blueberries and Maple Syrup. We had to exceed our $10 limit on this item because it was soooo worth the mention! You’ll taste the flavor of the plantains in these griddle cakes and the Mexican crema is made in-house. Oh, how I love FRESH! To top them off, the blueberries are marinated in agave nectar. Andy Erdmann, the Food and Beverage Manager of the Lounge, said you certainly don’t have to be a Hotel Havana guest to stop by their restaurant. All Ocho guests are special guests! Be sure to read Shannon’s blog, at The Long Table, for more details and a great interior picture. This is definitely a YES place for breakfast (especially for the sweet items) when you are ready for a leisurely treat. They are actually open long hours and their All-Day Menu is intriguing. 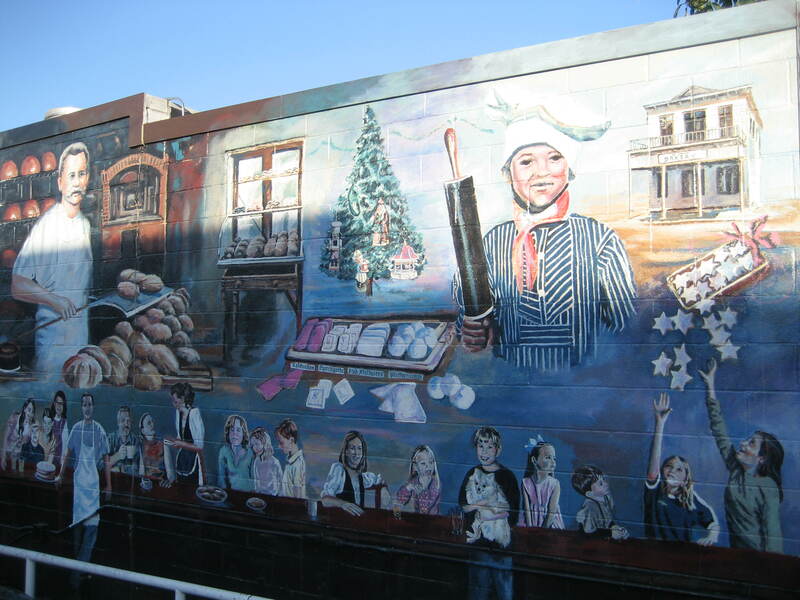 Featuring locally owned restaurants is our specialty. We love focusing on the epicurean entrepreneurs — the owners and their families — who dig deeply into their daily existence to serve fresh food every day their way. A slice of San Antonio entrepreneurial history can be found at Earl Abel’s Restaurant on the Austin Highway. We recently came across this video the San Antonio Chamber of Commerce produced because Earl Abel’s Restaurant has been a participating member since 1933! We could tell you wonderful things about the faithful staff and great food at Earl Abel’s, but the video says it all. Simply click on the picture below and enjoy! Congratulations to Roger Arias and the great staff at Earl Abel’s! Food Truck Foodies unite! It’s a “Food Truck Throw Down” this Friday through Sunday in San Antonio (July 29th – 31st) at Boardwalk on Bulverde (preferred haunt of the Rickshaw Stop)! All food is affordable and the entertainment won’t stop. We hear that 28 food trucks from all over the state will be there with cuisines as varied as the towns in Texas. Here are a few of the regular food trucks at Boardwalk on Bulverde. Watch for the Duk Truck (random rotating cuisine), Guilty Pleasures (comfort food) and Tapa Tapa (small plates, but especially fresh fruit with pop rocks) along with many others. If you fall in love with Boardwalk on Bulverde, return for “family-friendly fun,” on Kid’s Movie Night each Thursday this summer. Friday and Saturday evenings include a DJ who brings the kids in on the musical fun, too. *We recommend: 1) Evenings in the summer month, and 2) Sample a little of everything! When we received an invitation to stop by Rickshaw Stop — a local Pakistani street food truck — we went ready to meander through their entire menu. As it turns out, the menu was short and uncomplicated. The food was fresh and delicious! We pulled into the Boardwalk on Bulverde (regular haunt of the Rickshaw Stop), and realized this visit was going to be an adventure. Food trucks were circled around a picnic area like pioneer wagons for the night. Kids were playing on the gym equipment while folks were ordering up their favorites from the trucks serving their specialties. Owners, Sameer and Meagan Siddiqui, made us feel especially welcome with their friendly descriptions of the menu items. Sameer’s mother, aunt and uncle are all key players in this family venture, too. The family’s journey, which began in India and Pakistan, ended in San Antonio via New York. Our little band of foodies ordered up everything on the menu and shared around the picnic table. The Kebabs (not Kabobs), look somewhat like a Mexican taco, but the flavors are very different. Wrapped in a Paratha (Pakistani tortilla? ), the beef or chicken Kebabs were packed with flavor — especially after we sampled the various freshly made sauces on top. Our favorite Kebab? The chicken with Tamarind sauce. Mmmm. Loved those Parathas, too. Next came the Samosas. These crusty little pillows of flavor are inexpensive and fun to eat — smaller and lighter than the Indian versions we’ve eaten in the past. And dare I tell you? They’re obviously deep fried (uh oh), but the pastry shell is hand made and the fillings are great. Again, the three sauces were generously applied at will. All three Samosas (beef, chicken and vegetarian) were a hit with me, but then, I did use the word “fried” in my description didn’t I? What’s Kheer? Think rice pudding, made with rice milk, sugar, cardamom and rose water. These tasty little cups of unavoidable goodness are topped off with crunchy chips of almonds and pistachios. Speaking of desserts, we weren’t allowed to leave without sampling the one non-Pakistani item on the menu… Mom Siddiqui’s own recipe for Baklava. This version has much less honey, but plenty of flaky pastry. Sameer confesses his frequent addiction to crumbled Baklava stirred inside a bowl of Kheer. Ooooh, Yum + Yum = YUM! This place is “family-friendly,” too, with a Kid’s Movie Night on Thursday. Friday and Saturday evenings include a DJ who brings the kids in on the musical fun. Be sure to check the Rickshaw Stop website for their various hours of operation (usually just three evenings and Saturdays) and more details about their menu items. In the end, I knew this place was a hit when, just five hours later, I was thinking about when I could return. Our Recommendations: The Chicken Kebabs with Tamarind Sauce, all of the Samosas, the Baklava and Kheer. Also, go in the evening during cooler hours if the summer sun is glaring. We recently chatted with owner, Marty Lipscomb. Marty and his wife, J.P., make their Tortilla Soup fresh every day. Though they make several fresh soups each week, this is their guests’ favorite. Did we use the word “meatless” yet? This version has no chicken (yay, vegetarians!) with whole field tomatoes, zuccini, seasonings, cheddar and their own in-house white corn tortilla chips. (Now that makes me wonder what else they’re making with the whole tortillas!?) You’ll find Rotel tomatoes in the base with a few other secret ingredients. The only dairy is the cheddar on top. This favorite soup is made fresh daily and, oh, we must tell you the spicy “kick” is there, but it’s slight and just right. What else can you enjoy at Sweet Temptations? Chicken Cordon Bleu, hand breaded Chicken Fried Steak and Shrimp, wonderful salads w/ house made dressings, a variety of other freshly made soups, and on and on. These folks are open for breakfast and lunch only, so be sure to call ahead for their hours of operation. Here’s the link to their website once again. Since our great-great grandfather came over on the first boat with settlers from Germany to found New Braunfels, we periodically venture to New Braunfels to celebrate our German heritage. This last trip war fantastisch (was fantastic) for two reasons: 1) Lots of our family members were there together, and 2) We had a blast at Friesenhaus Restaurant. Coursing through my German veins is a passion for independently owned businesses in America. Perhaps it’s because of my heritage that I’m such a believer in living The Great American Dream. Günter and Cornelia Dirks, came to New Braunfels from Germany with their family, just six years ago. They had that same dream in their hearts. Their story is told well on the “About” page of their website. 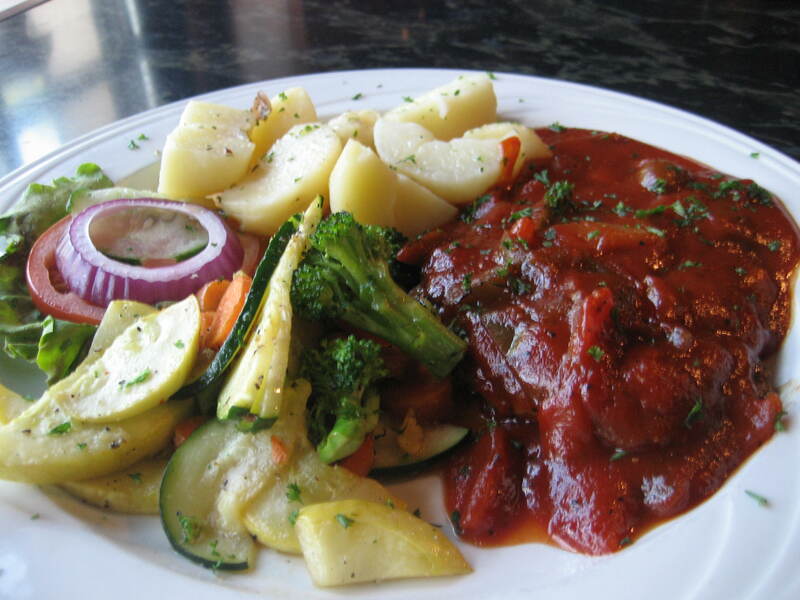 They planted their authentic restaurant in the old Krause’s location (an endorsement in itself) with the goal of helping to preserve the German heritage and traditions of the area. check out. I also tasted the sausage with sauerkraut and German potato salad. Sausage and sauerkraut make me think of my mama, so purely for that reason, I think it’s what I’ll order when I return. 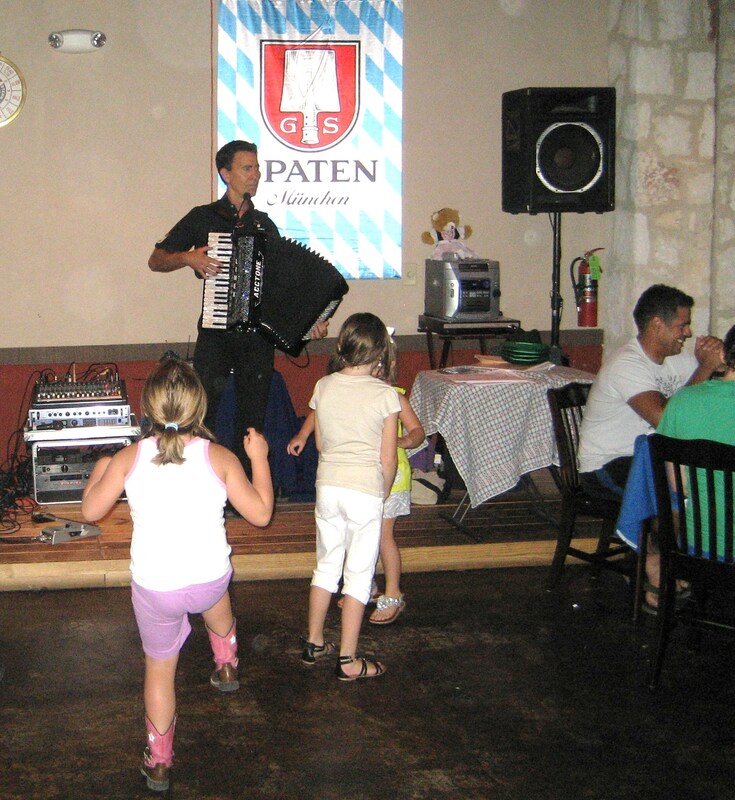 Kid-Friendly-Texas-Version-Polka Dancing (hardly recognizable to true polka enthusiasts, but clearly delightful for the kids). 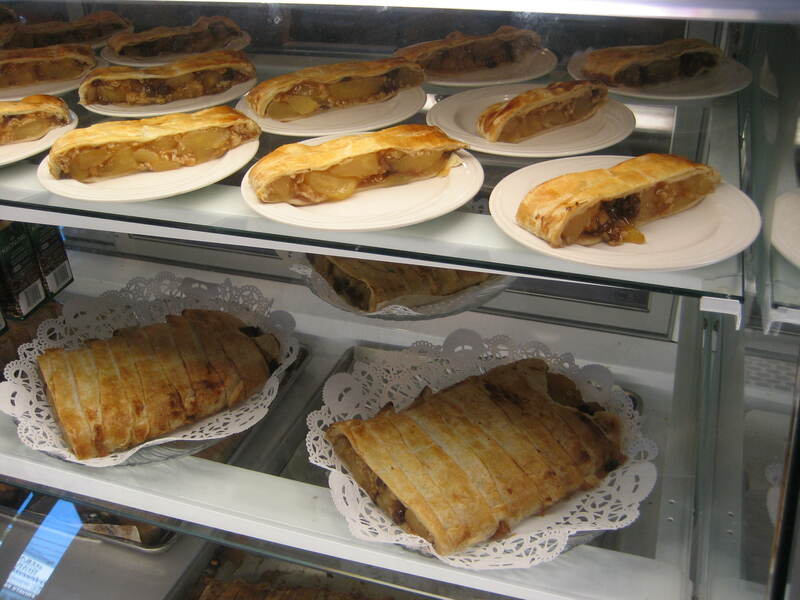 Strudel?) 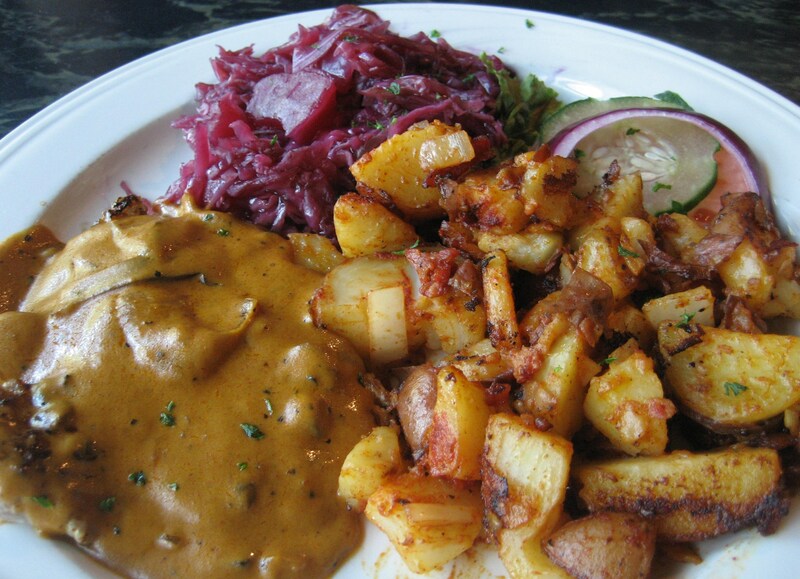 and good food, Friesenhaus is absolutely a family adventure you won’t want to miss.